Recent years have seen an exponential increase in land deals across the Philippines with the conversion of large expanses of land with crops mainly intended for export. Meanwhile, traditional upland farming practices implemented through swidden (‘slash-and-burn’) technology–known locally as kaingin or more appropriately uma–are demonized and antagonized through restrictive legislation. This is despite the fact that the latter fosters local self-sufficiency and plays a fundamental role in the livelihoods and worldviews of Indigenous societies. Palawan, known as the “Philippine last Frontier”, in spite of its unique recognition as a UNESCO Man & Biosphere Reserve, has not been spared from massive investments in extractive resources and industrial agriculture, especially oil palm and rubber. And yet, Indigenous Peoples and upland dwellers continue to be blamed for causing massive deforestation and ecological disaster. Not surprisingly, the recent front cover of a well known Philippine Newspaper (The Daily Inquirer, May 9 issue) holds a headline accompanied by a powerful image that easily conflates all upland peoples as criminal agriculturalists. “Images are powerful and can be damaging,” says Wolfram Dressler, a Research Fellow from the University of Melbourne (Australia), who has carried out extensive anthropological research in Palawan. “They can direct blame without nuance and context. The masses (and government) absorb such images to reinforce centuries-old narratives demonizing kaingin—a term that many farmers avoid because of its pejorative nature,” Dressler adds. The Inquirer‘s article was triggered by an aerial survey carried out by the Center for Sustainability (CS), a nonprofit organization that supposedly works for sustainable development in Palawan. The group spotted key locations from the air, previously covered by forest, which have now been cleared as a result of external forces such as mining, oil palm plantation development and shifting agriculture. According to the group, in addition to clearing by ‘poor farmers’, forest burning in the south has been linked to the proliferation of palm oil and rubber plantations, and the main target of ‘slash-and-burn’ activities is the clearing of primary forests for development. Ironically, for carrying out its photo survey, CS conservationists borrowed the private plane of multimillionaire Jose Alvarez, the present Governor of Palawan, who is a well-known supporter of large-scale agro-industry development (especially rubber which accelerates deforestation and deprives more traditional indigenous communities of their resource-base). He is a member of the same family that logged Northern Palawan’s forest in the eighties. He also chairs the Palawan Council for Sustainable Development (PCSD). In principle, this government body is mandated to ensure the sustainable development of the whole province through the implementation of a Strategic Environmental Plan or SEP (R.A. Republic Act 7611). Under the SEP, no development project should take place in Palawan unless the proponents secure a so-called SEP clearance. In reality, massive oil palm expansion and related forest clearing takes place without the requisite SEP clearance. “Here in Palawan, we have the best laws in place to protect both the environment and the rights of our Indigenous Peoples. However, the limits of law lie within the implementation process, wherein rules and regulations are conditioned by the inability of concerned government agencies and their officials to stand by their own mandates”. She further argues that the government prohibition to ban kaingin represents a blatant violation of the major tenets of the ‘Indigenous Peoples Rights Act of 1997’ (Republic Act no. 8371) which recognizes, protects and promotes the rights of indigenous cultural communalities. “This is a very powerful law… and should not be undermined by ‘minor’ laws and municipal ordinances banning shifting cultivation”, says Bero. In 1994, a ban against shifting cultivation (bawal sa kaingin) was enforced by former Mayor Edward Hagedorn through the so-called ‘bantay gubat’: an implementing arm composed of poorly trained forest guards. Sadly, when this happened, no murmur of dissent was raised by Palawan NGOs, in spite of the severe hardship experienced by hundreds of Indigenous communities because of the ban. The latter, however, was strongly opposed by Survival International (SI). An international campaign by SI resulted in a partial lifting of the ban. In the end, the former Mayor decided to allow Batak as well as Tagbanua tribes continue their traditional kaingin practices with a ‘controlled burning’ in place of the previous ‘zero burning’ policy. However, as the years passed by, the ban on kaingin was renewed with gusto. It is now being implemented under the current administration. “Ever since the ban on shifting cultivation was implemented in PPC Municipality, Survival has been lobbying for the government to exempt Indigenous communities, such as the Batak, from the ban”, explains Sophie Grig, Senior Campaigner at Survival International. “We are disappointed that in spite of international pressure, the local government still continues to implement a law which is creating food-shortage and malnutrition amongst the previously self-sufficient tribes of Northern Palawan”. In spite of its failure, the ‘ban on kaingin’ initially implemented in Puerto Princesa Municipality, is now being emulated by others. Recently, the Government of Brooke’s Point has proposed the implementation of similar restrictions in its own municipality and, if the ban will push through, hundreds of upland Pala’wan communities will be threatened with food insecurity and malnourishment. The CS aerial survey added more fuel to the fire, through the production of dramatic photos that are presented without due context. These images prompted Governor Jose Chaves Alvarez to declare war on kaingin by proposing the creation of a “forest conservation task force that will undertake a 10-year plan to arrest the problem of slash-and-burn farming”. “We are extremely worried about these new developments,” says John Mart Salunday, an Indigenous Tagbanua who is presiding NATRIPAL, the largest Indigenous federation in Palawan. 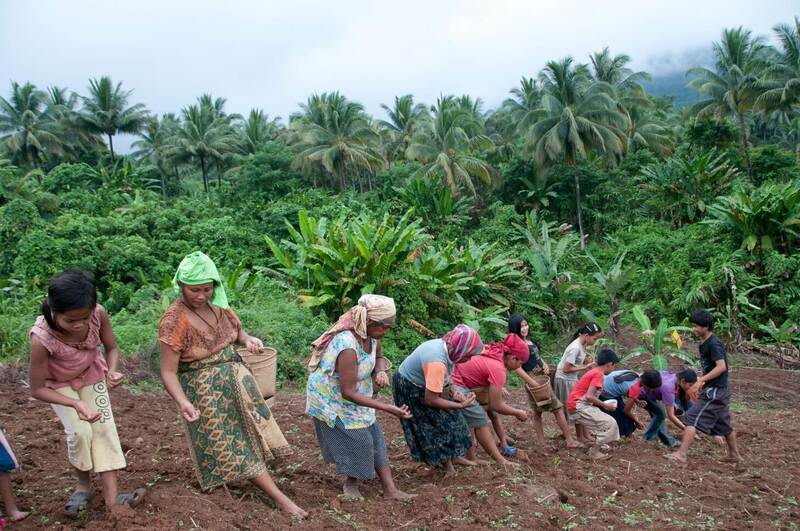 A group of indigenous Pala’wan planting upland rice in the Municipality of Brooke’s Point. The richness and complexity of indigenous upland farming systems in Palawan has not gone unnoticed to both local and foreign researchers such as Roy Cadelina, James Eder, Melanie McDermott, Nicole Revel, Charles Macdonald, Wolfram Dressler and Dario Novellino who have carried out in-depth studies on indigenous farming practices and their relevance in local cosmologies, worldviews, identities and ethnobiological knowledge. “If one compares the wisdom of Indigenous upland farmers to the ignorance of most foresters, politicians and conservation biologists in the same field of knowledge, the gap is striking,” observes Dario Novellino, an anthropologist from the Centre for Biocultural Diversity at the University of Kent (UK), who has lived in Palawan for almost 30 years. Novellino maintains that the government ban on kaingin in Puerto Princesa, rather than protecting the environment, has placed insurmountable pressure on the forest and altered the sustainability of the indigenous farming system. Well-known scholars have argued that traditionally practiced kaingin (or integral kaingin) involves the intermittent clearing of small patches of forest for subsistence food crop production, followed by longer periods of fallow in which forest re-growth restores productivity to the land. However, when such a complex system is altered–for instance, through the implementation of punitive policies–the repercussions on forest ecology and people’s sustenance becomes dramatic. 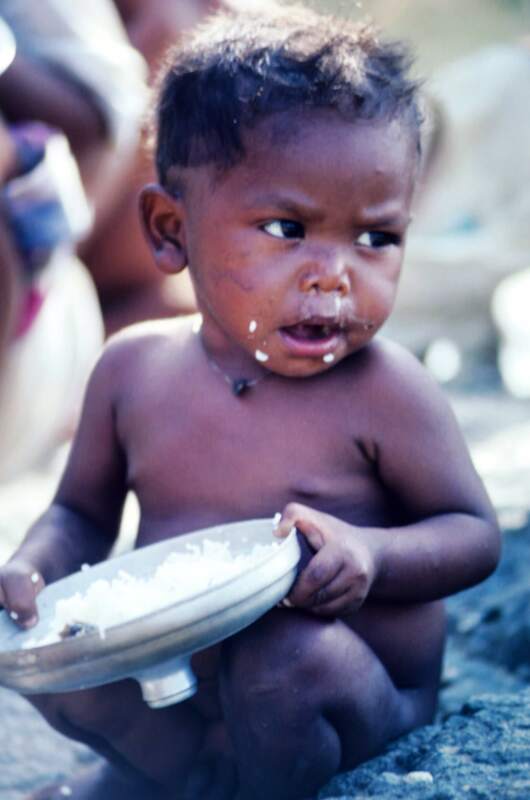 According to Novellino, when Indigenous upland communities are not allowed to procure carbohydrates (rice, cassava, sweet potatoes, etc.) necessary for physical survival, through their farming practices, they are forced to increase pressure on commercially valuable NTFPs (non-timber forest products) such as rattan, almaciga and honey which they must in turn sell to purchase rice. This can result in the swift depletion of non-timber forest resources and place even more pressure on the forest itself. Indeed, this is exactly what happened because of the implementation of the ‘zero burning policy’ by former Mayor Edward Hagedorn. One can only speculate why the Government of Palawan is so quick to raise its voice against kaingin while remaining silent about the huge expanses of forest and fertile land that the agro-industry receives. We know the official explanation: oil palms are only planted on ‘idle’ and ‘abandoned’ land to enhance the province’s economy while increasing job opportunities and transforming unused areas into productive plantations. But are such lands truly ‘idle’ and ‘abandoned’? A recent study by ALDAW (Ancestral Land/Domain Watch) indicates that the answer is ‘No’. According to the study, most of the so-called ‘idle’ and ‘unproductive’ lands include areas that have been used since time immemorial by Indigenous societies. “The removal of natural vegetation and of previous agricultural improvements by oil palm plantations is leading to the total collapse of traditional livelihoods, thus fostering communities’ impoverishment and increasing malnutrition”, says Novellino. He sustains the Government has failed to consider that most of the so-called ‘idle’ and ‘underdeveloped’ lands include areas that are being utilized by rural and Indigenous populations for different purposes (gathering of NTFPs and medicinal plants, kaingin, etc.). He believes that a direct relationship exists between oil palm/cash crop expansion, the impoverishment of people’s diets, the progressive deterioration of traditional livelihoods and the interruption of cultural transmissions related to particular aspects of local knowledge. Apparently, this is not perceived by the Government as a strong enough reason to switch its development agenda towards more sustainable forms of agriculture. Instead, local food security continues to be sacrificed in the name of oil palm and rubber development while anti-kaingin policies are strongly implemented with no distinction between traditional Indigenous farming practices and migrants’ unsustainable slash-and-burning. “If the government is serious about ensuring the welfare of its constituents it should enhance the capability of upland farmers to produce enough food, rather than fostering cash crop[s] such as [oil palm] and rubber that are not for local consumption but for export. For the sake of fairness, we should now ask ourselves whether Indigenous shifting cultivation practices throughout Palawan are sustainable (based on long fallow periods). At present, they are not sustainable; nevertheless, the blame for forest destruction should not be placed on upland dwellers. One need only look at the historical process that led to unsustainable kaingin practices such as the dramatic reduction of Indigenous ancestral domains due to massive migration of landless farmers, encroachment by mining and plantation companies, insurgency and militarization just to mention few. It is a rather nice irony that official propaganda against kaingin–coupled by NGOs’ market-based conservation approaches–continues to provide additional incentives for international institutions to finance more of the same (e.g. 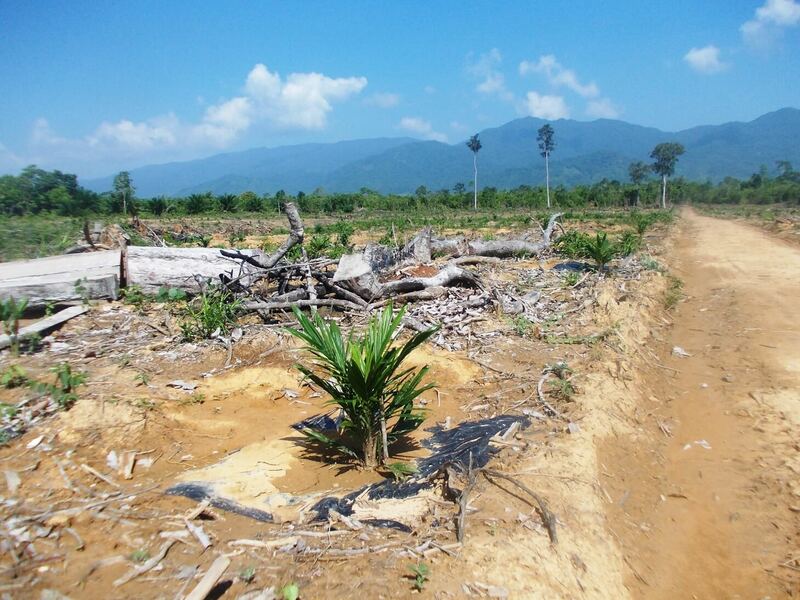 reforestation of indigenous fallow fields which are wrongly classified as ‘degraded areas’). Often, such reforestation programs deprive local communities of areas that are necessary for field rotation, thus jeopardizing the sustainability of their farming system. 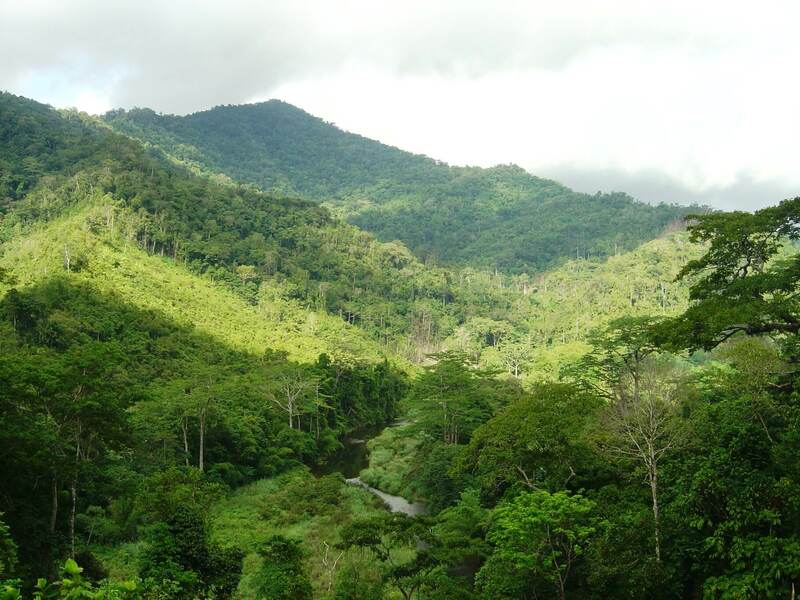 It will require detailed and multidisciplinary studies to determine where, and to what extent, the conditions for optimal long fallows in Palawan are still present and how many Indigenous communities are still practicing long rotation cycles. In turn, the law should move away from coercion and demonization of kaingin towards more culturally-sensitive approaches that provide incentives to Indigenous cultivators for increasing and fostering production of local genetic varieties of rice and other traditional cultivars. In places where swidden practices have become irreversibly unsustainable, specific strategies should be developed in close coordination with local communities, rather than imposing top-down technical solutions and enforcing legal persecution. In other words, upland farming strategies should be evaluated through an integrated and interactive long-term process of research and development in close partnership with local upland farmers. This process should identify Indigenous best farming practices, taking care to understand them and the contexts in which they are used. Meanwhile, in the short term, it would wise if journalists and their ‘zealous’ conservationist allies refrain from publishing images that uncritically depict upland dwellers as ‘environmental criminals’, putting the blame of deforestation on those who suffers from it most.